Is Adderall Aftercare Rehab Necessary? What is Adderall Rehab Aftercare? Adderall is a prescription medicine used in the treatment of narcolepsy and Attention Deficit Hyperactivity Disorder (ADHD). It is a prescription stimulant composed of amphetamine and dextroamphetamine. The potential for abuse of medications like Adderall is very high. 'Aftercare' refers to the continued services that are offered to recovering substance abusers after a structured treatment program ends. The initial phase of treatment, commonly referred to as detoxification, is aimed at stopping the use of the drug of abuse under supervision with the aim of making abstinence safe and distress free. However, the treatment of addiction does not end at detoxification and it is important to ensure continuity of care in the form of 'aftercare'. Drug avoidance / refusal skills. Social and stress coping skills. Relapse prevention is an aftercare strategy aimed at preventing and delaying reuse of the drug. Someone who has quit Adderall use is trained to identify the situations and states that can lead to renewed drug use. Also, the individual is supported in developing strategies to deal with these high-risk situations with an aim to prevent relapse. Involvement in selling the drug. The importance of aftercare in management of Adderall relapse prevention is highlighted by the fact that engagement with aftercare services such as self-help groups has been reported to be protective against relapse among stimulant abusers. Aftercare interventions aimed at relapse prevention among amphetamine-type stimulant abusers have been found to be effective in improving long-term outcome over a period of 2-5 years. Prescription drug abuse is a growing public health problem. Adderall abuse is a chronic health condition that shares many similarities with other chronic medical disorders such as diabetes and hypertension. The natural course of addiction may extend over years, with periods of remission and relapse. Among those who attempt abstinence, relapse is a realistic possibility. In fact, relapse has been described as a central characteristic of addictive disorders. The road to recovery from addictive disorders is long and setbacks are expected throughout the journey. However, relapse and return to drug use should not be seen as a failure of the treatment. Drawing parallels between chronic medical disorders and Adderall addiction makes a lot of sense as the two share similar causal paradigm as well as long-term course and outcome. Relapse in the form of reoccurrence of symptoms is observed among in 5 to 7 out of every 10 adults with hypertension. Treatment adherence remains a challenge for both addictive disorders and chronic conditions like hypertension alike. Less than 40% of adults with hypertension are completely adherent to treatment. Retention in treatment is often seen as a major determinant of the outcome for these conditions. Effective management of Adderall abuse calls for continuity of care. Aftercare services can help improve the outcome by providing support and counseling beyond the initial phase of treatment to help prevent relapse and encourage a sustained drug-free lifestyle. Cognitive Behavioral Therapy (CBT) has been found to be effective for amphetamine-type stimulant abuse. CBT—even when offered for a brief duration—has been found to be effective in improving abstinence at six-month follow-up as compared to self-help reading material in a randomized controlled trial. CBT offered in a residential Therapeutic Community setting has been found to be associated with reduced amphetamine use as well as improved drug refusal and avoidance skills, problem-solving skills, social and stress coping skills, coping with a slip into drug use, and coping with personal high-risk situations. Cognitive Behavioral Therapy (CBT) among poly-drug amphetamine users re-entering residential therapeutic communities (TCs) has been found to be associated with enhanced drug refusal and avoidance skills, problem-solving, social and stress coping skills. Similarly, other aftercare interventions such as contingency management (CM) and Matrix Therapy have been found to improve retention in treatment, reduce stimulant use, delay relapse, encourage abstinence, improve employment status and reduce use of other drugs among those with amphetamine-type stimulant abuse. Additionally, these interventions have been found to be effective among prison inmates and also lead to a reduction in high-risk sexual behavior associated with increased risk of HIV among amphetamine-type stimulant abusers. 12-step facilitation is a self-help program aimed at recovery from addiction by working ‘the steps’. One recognizes their problem with addiction and admits being powerless over the substance in question. 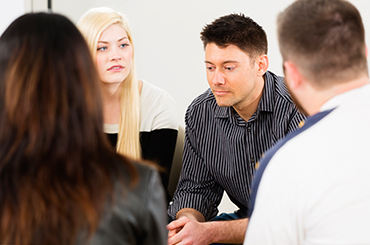 Members are encouraged to share their process of recovery and associated problems with others in meetings. One is also encouraged to identify a sponsor – a more experienced member of the group to help guide them through the recovery process. Although, effectiveness of 12-step facilitation program for Adderall abusers has not been systematically studied, findings from studies among other stimulant abusers lend support to its potential role among Adderall abusers. Modified, or alternative, step programs that integrate the self-help and mutual support model with elements of CBT—such as Self Management And Recovery Training (SMART recovery)—have also been developed for amphetamine-type stimulant abusers. Research into pharmaceutically aided treatment approaches—including substitution therapy—have shown promise in the treatment of amphetamine-type stimulants. Despite this promising lead, there currently are no FDA-approved medications for its long-term management. Medications aside, those with a history of Adderall abuse may require close follow-up with a medical professional because of the associated adverse physical and psychological consequences. Research shows that medical conditions such as poor oral health, myocardial infarction, respiratory failure, stroke, cardiomyopathy, hepatitis; and mental health concerns like paranoia, psychosis, and depression are associated with amphetamine-type stimulant abuse. Also, high-risk behavior associated with amphetamine-type stimulant abuse increase risk of HIV and viral hepatitis transmission. To know more about how health damage associated with Adderall abuse can be addressed in a substance abuse rehab program, contact our treatment support team at 1-888-993-3112Who Answers?. Sober living environments typically encompass long-term residential programs, and are best suited for those recovering addicts who require a structured support system even after the initial phase of treatment. Therapeutic communities are planned around a central core of group activities directed toward effecting significant changes in the residents' lifestyles, attitudes, and values. These are designed to allow positive changes and stabilization in the client's attitudes and lifestyle with an emphasis on prosocial behavior. Residents abusing amphetamine-type stimulants have been reported to achieve reduced substance use, reduced criminal offenses, and improved physical and mental on program completion. These therapeutic communities have also been found to be effective for prison inmates abusing amphetamine-type stimulants. Amphetamine abusing adolescents attending the therapeutic community fare comparably to those abusing other drugs. Modified therapeutic community programs supplemented by CBT or contingency management have been found to be associated with reduced use of amphetamine, post-treatment. CM, when offered alone or in combination with CBT, has been found to be effective for amphetamine-type stimulant abusers. It is associated with improved retention in treatment, more drug-free urine samples and a longer period of abstinence. Contingency management has been recommended as a useful component of residential and out-patient treatment program for amphetamine abuse. If you or someone you love have seen their prescription Adderall use turn into a daily struggle, marked by an inability to cope without the drug, it’s time to seek help. Our treatment support specialists can provide more information on treatment programs and aftercare options at 1-888-993-3112Who Answers?. Family and significant others play an important role in recovery from Adderall abuse and are encouraged to be a part of the treatment process. Family members stand to benefit by becoming well informed on the issues related to Adderall abuse and its management. Family can be immensely helpful in encouraging recovering loved ones to remain engaged in treatment. Seeing a relative or a friend battle the challenge of Adderall addiction can be challenging. The adverse consequences associated with Adderall abuse extend beyond the user and affect the significant others as well. Family and friends need to be aware of their own psychological and emotional health and discuss their feelings with others. There are self-help support groups for the family members of friends of drug users that you can access. Hando J, Topp L, Hall W. Amphetamine-related harms and treatment preferences of regular amphetamine users in Sydney, Australia. Drug Alcohol Depend [Internet]. Elsevier; 1997;46:105–13. Hawkins JD, Catalano RF, Gillmore MR, Wells EA. Skills training for drug abusers: generalization, maintenance, and effects on drug use. J Consult Clin Psychol [Internet]. American Psychological Association; 1989 [cited 1989];57. Vocci FJ, Montoya ID. Psychological treatments for stimulant misuse, comparing and contrasting those for amphetamine dependence and those for cocaine dependence. Curr Opin Psychiatry [Internet]. NIH Public Access; 2009;22. Shoptaw S, Reback CJ, Peck JA, Yang X, Rotheram-Fuller E, Larkins S, et al. Behavioral treatment approaches for methamphetamine dependence and HIV-related sexual risk behaviors among urban gay and bisexual men. Drug Alcohol Depend [Internet]. Elsevier; 2005;78:125–34. Matsumoto T, Imamura F, Kobayashi O, Wada K, Ozaki S, Takeuchi Y, et al. Evaluation of a relapse‐prevention program for methamphetamine‐dependent inmates using a self‐teaching workbook and group therapy. Psychiatry Clin Neurosci [Internet]. Wiley Online Library; 2014;68:61–9. Brecht M-L, von Mayrhauser C, Anglin MD. Predictors of relapse after treatment for methamphetamine use. J Psychoact drugs [Internet]. Taylor & Francis; 2000;32:211–20. Reske M, Paulus MP. Predicting treatment outcome in stimulant dependence. Ann New York Acad Sci [Internet]. Wiley Online Library; 2008;1141:270–83. Brecht M-L, Herbeck D. Time to relapse following treatment for methamphetamine use: a long-term perspective on patterns and predictors. Drug Alcohol Depend [Internet]. Elsevier; 2014;139:18–25. Rawson RA, Huber A, Brethen P, Obert J, Gulati V, Shoptaw S, et al. Status of methamphetamine users 2–5 years after outpatient treatment. J Addict Dis [Internet]. Taylor & Francis; 2001;21:107–19. Thomas Mclellan A. Drug Dependence, a Chronic Medical Illness. JAMA [Internet]. 2000;284:1689–95. Baker A, Lee NK, Claire M, Lewin TJ, Grant T, Pohlman S, et al. Brief cognitive behavioural interventions for regular amphetamine users: a step in the right direction. Addiction [Internet]. Wiley Online Library; 2005;100:367–78. Donovan DM, Wells EA. “Tweaking 12‐Step”: the potential role of 12‐Step self‐help group involvement in methamphetamine recovery. Addiction [Internet]. Wiley Online Library; 2007;102:121–9. Pates R, Riley D. Interventions for Amphetamine Misuse [Internet]. John Wiley & Sons; 2009. Hawke JM, Jainchill N, De Leon G. Adolescent amphetamine users in treatment: Client profiles and treatment outcomes. J Psychoact Drugs [Internet]. Taylor & Francis; 2000;32:95–105. Melin GL, Götestam KG. A contingency management program on a drug-free unit for intravenous amphetamine addicts. J Behav Ther Exp Psychiatry [Internet]. Elsevier; 1973;4:331–7. Rawson RA, Huber A, McCann M, Shoptaw S, Farabee D, Reiber C, et al. A comparison of contingency management and cognitive-behavioral approaches during methadone maintenance treatment for cocaine dependence. Arch Gen Psychiatry [Internet]. American Medical Association; 2002 [cited 2002];59:817–24. BAKER A, LEE NK. A review of psychosocial interventions for amphetamine use. Drug Alcohol Rev [Internet]. Informa UK Ltd UK; 2003;22:323–35.